Take the chicken upside down and take out the breast bone using a sharp knife. Cut between the thigh and breast pieces. 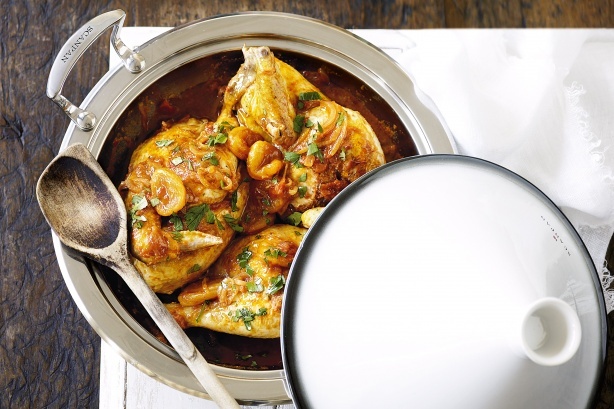 Heat the oil in an ovenproof tagine and fry the chicken on each side golden brown for 3 minutes. Transfer into a plate and set aside for now. Turn the heat to low and fry the onions, garlic and ginger for 2 minutes. Throw in the saffron, harissa, cumin and cinnamon. Toss around for 30 seconds. Throw in the chicken and toss to get it coat evenly. Throw in the tomatoes with the stock. Bring the mixture to a boil. Let it simmer for 45 minutes. Add apricots and cook for another 15 minutes. Take out the chicken again and set aside. Add in the coriander and parsley and thicken the sauce. Once the texture is right, add the chicken again and serve hot.